Size: 1 quarter scale mile x 3 inches, totalling 576 square inches. QMS is a Racing Circuit for Trackmobiles. – a finish apron with a refreshment stand. The layout has a colorful backdrop over its full length, with different landscape scenes to distract the contestants. In the foreground there is a footpath along the track for Preiser officials to check if the rules are obeyed. The challenge is to run the Quarter Mile Slow as slowly as possible, using a hand throttle. The Trackmobile may pull or push any number of cars, but movement has to be continous. Stalling means instant disqualification. This micro is far less wide than usual shelf layouts and can be adapted to any room. A meandering shape is also possible. Or in a corner. If constructed in a circle, it can be used for the Half Mile Slow, the Full Mile Slow and of course for the Trackmobile Annual Marathon. 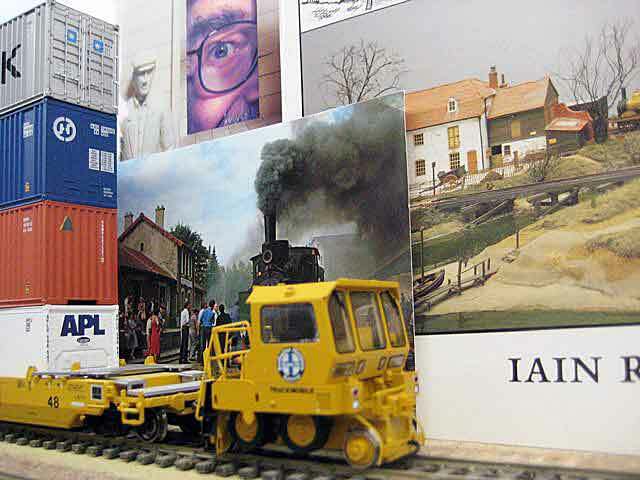 The photo below shows the experimental distracting backdrop, with a Trackmobile in power training for the QMS.